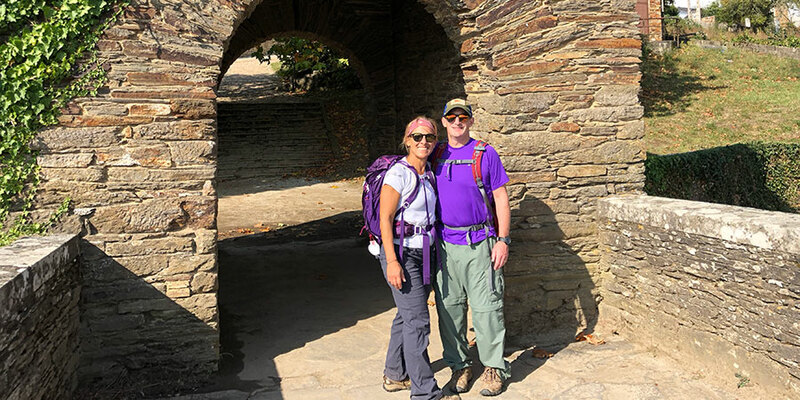 Author Jeanne McWilliams Blasberg shares her Camino experience and why she feels the trail is the perfect place for romance. When my husband got down on one knee in the Sacred Valley of Peru and asked me to spend another twenty five years by his side, I teared up. That romantic gesture was four years ago, and although I did embrace him with a great big yes, it wasn’t until our adventure this fall, walking the last 210k of the Camino that I experienced true second honey-moon bliss. I’ve always been a believer that walking together, whether on the beach or just around the neighborhood, forges a relationship. I rekindled an old college best-friendship hiking Mt Kilimanjaro, the slow pace of our ascent offering the opportunity to catch up after a long gap spent raising our families. Walking the Camino, however, would prove much different than Kili or that earlier trek to Macchu Picchu with my husband. 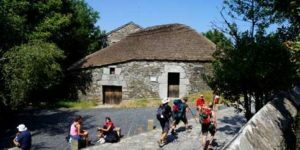 The Camino is done without guides or porters, it can be both a social and a personal journey, it can be filled with spontaneous deviations, and it turns out to be very well suited for romance. Wait what? Arriving a few months later at our starting point in Ponferrada, we were a little jet lagged and stunned, anticipating what we had in store for the next twelve days. 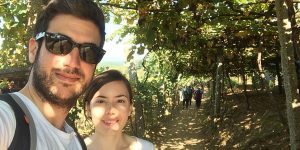 We left the room in search of an early dinner (still technically lunch time in Spain) and were immediately surrounded by beauty, good food and wine. We discussed our intention for the walk. If nothing else, we would eat well, but agreed to be open to however the trip might unfold. 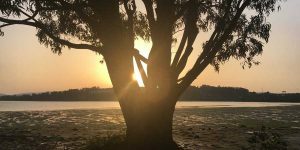 In the beginning, I was skeptical and a little worried about the itinerary (I had turned all the details over to this company called CaminoWays and departed home in a haste). Twelve days! My husband and I would be doing a lot of talking or would it be re-hashing? We would likely develop aches and pains that would need attending – his knee was scheduled to be replaced upon our return! Yes, I’d seen “the movie” and knew there would be inspiring scenery and friendly people along the way, but aside from all that, I didn’t know what to expect. Besides the revelations that are too numerous to include here, what I never expected were the long, lazy afternoons. We’d typically end the day’s walking around three or four pm with plenty of time to spare before a Spanish dinner. Our luggage would be waiting, as was a comfortable bed and dinner reservation. (I must say twelve days of successful logistics felt nothing less than miraculous!) Free of touristy concerns or the need to go sight-seeing, we surrendered to blissful exhaustion and desire to get horizontal. A pillow never felt so plush. We had plenty of time to write and read, in fact my husband and I took turns reading aloud to each other. There was plenty of time for other things too… Warm showers, massaging each other’s muscles, exchanging foot massages, and napping led to a physical and spiritual intimacy we hadn’t made time for in ages. My husband and I talked about a thousand unexpected things and shared long stretches of silence. During the filming The Way Emilio Estevez’s son, Taylor, fell in love with one of the pilgrims and married and currently lives in Burgos Spain, a town on the route. I wasn’t surprised to learn this. 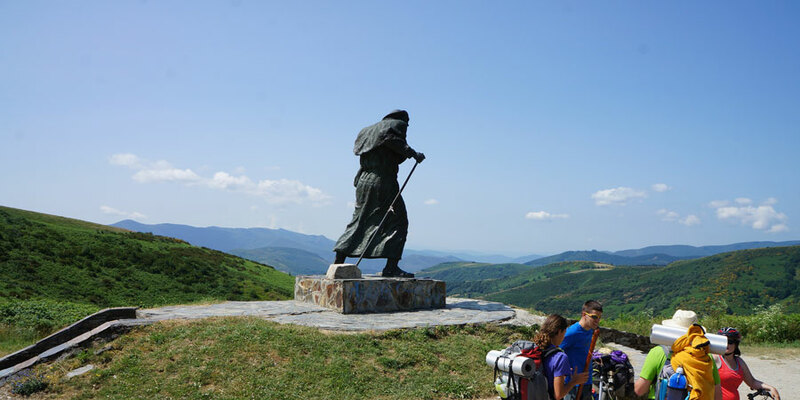 The simplicity of life on the Camino (and one expertly laid out by CaminoWays) leaves space for so many other things – for laughter, quiet reflection, and most of all, for love. Jeanne McWilliams Blasberg is an award winning novelist and travel writer from Boston, USA. She and her husband can’t wait for their next walking journey!